Cuban hats are always in style no matter what. It provides a feeling of completeness to your outfit. 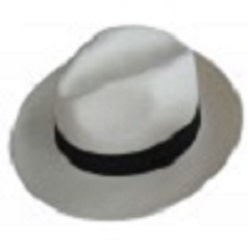 Gift-wrap offers you a Cuban hat which is made up of high quality. Buy it for yourself or for your friend or someone in the family. These Cuban hats are considered as one of the essential items when we talk about men's wear. Apart from the fashion look, they offer, Cuban hats also saves you from wind, rain and sunlight. Giftwrap offers valuable items to its buyers to make sure they get the high-quality products at affordable price. It gives bulk discounts and nationwide door step delivery. It's time to look chic with stylish Cuban hats. Headwear is an essential part in every wardrobe. Men love wearing hats. They are a fashion item as well as has a function. They protect against sunlight, wind and rain. They also protect the hair from getting damaged through sunlight or heat exposure. It's made with good quality fabric that suits everyone. There is a paper straw to add dimension and style into it. It's available in white color with black straw. It can go well with any outfit because it's white.